One of the StockBee members (CKBergin) mentioned this market breadth indicator a week or so ago and I thought it was an easy-to-read breadth indicator worth sharing. The Bullish Percent Index (BPI) is a breadth indicator based on the number of stocks on Point & Figure buy signals within an index. Because a stock is either on a P&F buy or sell signal, there is no ambiguity when it comes to P&F charts. 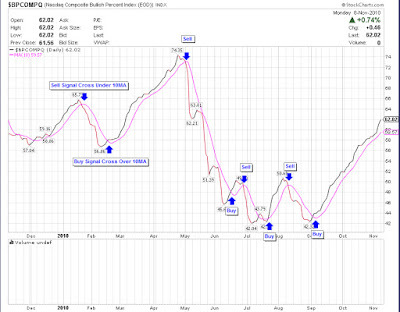 This makes BPI a straightforward indicator with clearly defined signals. Basically, you are watching for the daily index line to cross over or cross under the 10 day moving average. When the you get a cross above, you would move in to the market, cross under you move back into cash. Wonder stockbee Market Monitor get you out of market every few months ? For those looking to hold stocks for 1-2yrs period, would this tool be of help ? Can you set this up in telechart? If so how would you do it? 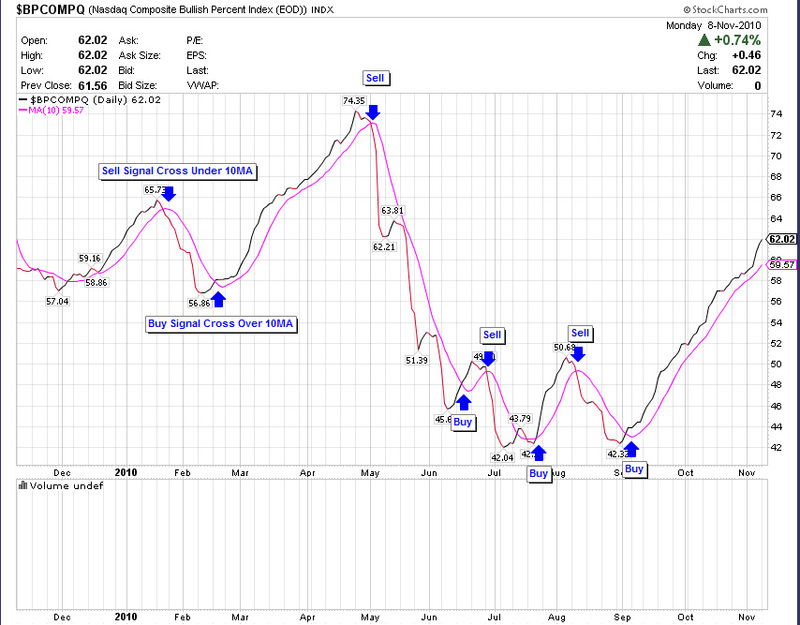 MP, Yes, You can use the primary indicator to move in and out of the market when it shows extreme weakness like it did before the crash in 2009. Jose, I did some hunting around and I'm unable to recreate this chart in Telechart. At this time, It is a fabulous and informative website about financial market. It is a very useful for us. So, I like it very much. Many many thanks for make this website. If you want more informastion about stock charts to visit stock charts Buying the appropriate Monitor Timeframes is an essential part from inexperienced persons stock options buying and selling along with location encourage chart. In accordance with just how long the positions characteristically carry on, you might want to buy a time schedule that's compatible.